An iconic former flour mill at the heart of London’s Royal Docks will be transformed into a vibrant centre for business and enterprise. An iconic former flour mill at the heart of London’s Royal Docks will be transformed into a vibrant centre for business and enterprise thanks to £12 million of government funding, Local Growth Minister Penny Mordaunt announced today (21 January 2015). The Millennium Mills site has been out of use since the early 1980s but work has now begun to demolish parts of the interiors and rid the building of asbestos contamination. The funding will fast track its renovation by 5 years and make it ready to welcome the next generation of start-up businesses by 2017. Redevelopment of the 450,000 sq ft land-mark forms the centrepiece of a wider £3.5 billion project to transform the Silvertown Quays part of the Royal Docks from the industrial to the digital age delivering 5 million sq ft of business and retail space, more than 20,000 new jobs, 3,000 new homes and contributing £260 million each year to the London economy. It is the latest in a string of exciting investments at London’s enterprise zone, including plans to create the UK’s largest floating village at Royal Victoria Dock and the ABP business port at Royal Albert Dock. 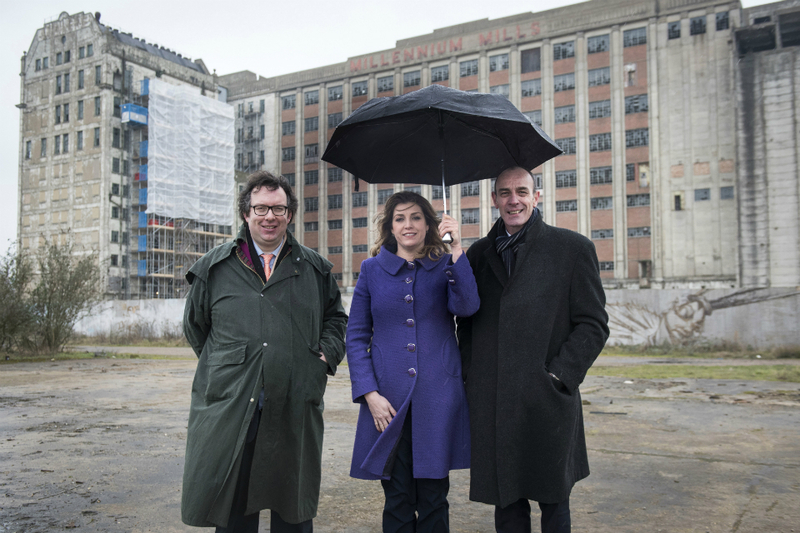 The Local Growth Minister visited the site today with London’s Deputy Mayor for housing and Land, Richard Blakeway, to see how work was progressing. 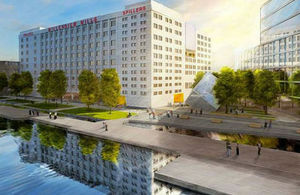 It’s great to see work starting on Millennium Mills at London’s enterprise zone. This iconic building, once a symbol of decline, will be the centrepiece of a thriving new business district that will create thousands of new jobs and bring prosperity back to the docks. That’s why we are investing £12 million to kick-start this project. It’s all part of a long-term economic plan that is driving business forward and delivering real benefits to hard-working people. Local Growth Minister Penny Mordaunt visits Millenium Mills. The 62-acre Silvertown Quays site is proposed to become the world’s first cluster of purpose built centres for product innovation, where top brands will be able to showcase their latest products and interact with customers in an entirely new way. The historic waterfront will be opened up with cafes, restaurants, galleries and public spaces, where people can come to research, learn and discover new products and ideas. It will be a thriving new destination expected to attract around 13 million visitors each year. The £12 million funding has granted through the government’s ‘Building Foundations for Growth’ enterprise zones capital grant fund.